Maybe New Belgium listened to the criticism of the ho-hum Ranger and wisely brought the IPA masters from Alpine in for some lessons. 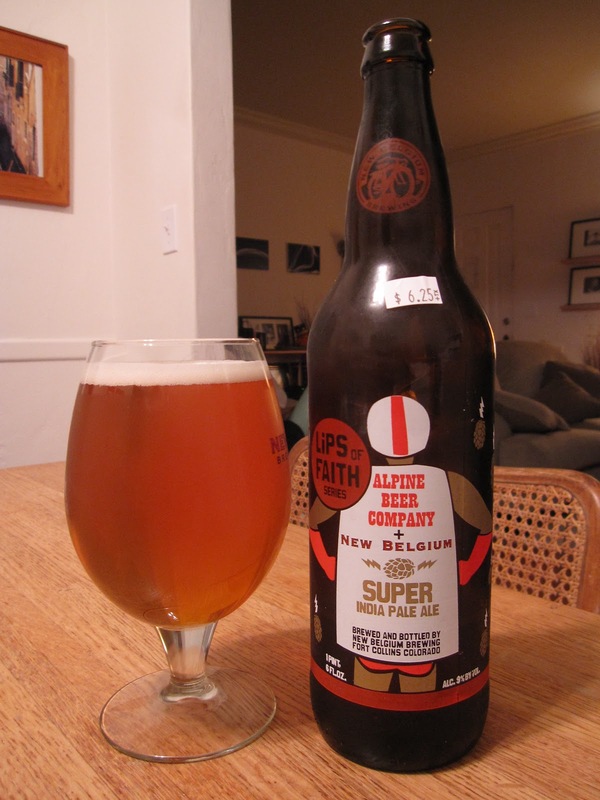 And Alpine gets the benefit of being able to make a New Belgium-sized production run of one of their beers and get their name out to a wider audience (the greedy, selfish Alpine-lover in me is not a big fan of that, by the way). Knowing how good and how bad Alpine and New Belgium are at making IPA, respectively, makes me a little bit unsure of how this one will turn out. The smell is highly citrusy, with a heavy hit of lemon. At first, the lemon sort of obscures any malt aroma, but on repeated sniffs, there's indeed a fairly hefty caramelly sweetness lurking in the background. Flavor wise, the hops are all Alpine- again, citrusy as hell with almost no bitterness. But the malt backbone is curiously un-Alpine- it's seems pretty rich, and there's a fairly strong sweetness than lingers on the palate nearly as long as the hops do. Now, it's been some time since my last clean-palated encounter with Pure Hoppiness or Bad Boy, but in my recollection, they're considerably drier than this*. So, in the end, this is very good, and way better than anything hop-oriented that New Belgium's been able to make on their own. But I feel like it's a step down from Alpine's solo efforts. Maybe they pulled a punch or two while they were in Fort Collins? The greedy, selfish Alpine-lover in me hopes so. *Out of curiosity, I tracked some Pure later on to compare it, and it's definitely not this sweet.